What failures most commonly plague die designers and builders, and metalforming companies? 1) Excessive wear and galling, leading to short punch life, poor-quality holes and generally unacceptable performance. 2) Slug-control failures, leading to rejected parts at best and damaged die components at worst. 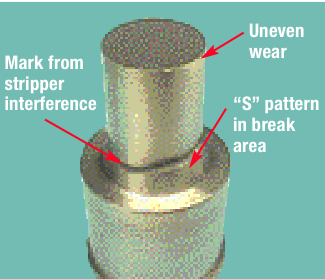 3) Punch breakage or deformation, leading to downtime, additional die damage and breakage and delays. 4) Excessive burrs, leading to short runs, defective parts and additional downtime. A general practice in designing and building a stamping tool is to apply a common punch-to-matrix clearance to all of the perforated holes, regardless of size. Unfortunately there comes a point when hole size becomes too small in relation to the part material thickness for that clearance to be effective. This results in high punch loading, longer burnish in the hole and excessive burr. This phenomenon begins to occur when the hole size drops below 1.5 times the material thickness. At that point it becomes more difficult to bend and cleanly break the slug free. 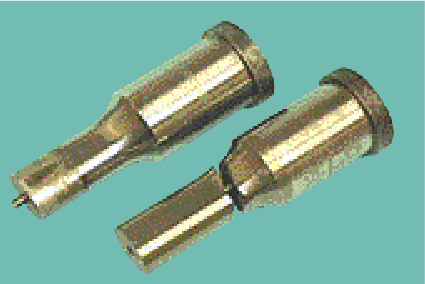 The two punches pictured above are identical in design, with one exception. The top punch, of M2 tool steel, lasted through years of use. The bottom punch, of A2, failed after a few hits. Even though both punches are of equal hardness, the M2 punch possesses superior compressive strength, allowing it to withstand high-load applications. Increased leverage to bend and break the slug can be achieved by increasing the punch-to-matrix clearance. A rule of thumb: Add a clearance of 1 percent per side to the existing clearance when the hole size is 1.5 times material thickness, and increase clearance as hole size lessens. A hole equal in diameter to material thickness will need additional clearance of approximately 4 percent per side. Hole characteristics vary with clearances. Regular clearance typically results in a high percentage of shear or burnish with minimal rollover and break. The hole tends to be smaller than the punch point. Engineered (increased) clearance achieves a low percentage of shear or burnish, with greater rollover and break. The hole size with engineered clearance will be larger than the point of the punch. This picture illustrates a typical head-breakage problem. Straight punches such as this have the greatest potential for head breakage because they provide the least amount of support at the head end. Redesigning the punch with a larger body will reduce head breakage in this application; changing the punch material to a more shock-resistant grade also will minimize the likelihood of head breakage. At impact, a compressive load rapidly builds, sending a shock wave through the punch. There is a brief moment where the punch comes to a stop as the backlash and flex of the ram and press are taken up. With a typical punch-to-matrix clearance—5 percent per side—part material begins to bulge out from under the point of the punch. The flow of the part material results from a high compressive loading, leading to compressive and shock-related tooling failures. An engineered punch-to-matrix clearance of 9 to 20 percent per side places the part material under a much lower tensile load, minimizing compressive load and associated problems. When the part material exceeds its tensile limits, the slug suddenly separates from the part. This sudden unloading of pressure on the punch generates a reverse shock that often leads to punch-head breakage. This photo illustrates chipping across the face of the punch. 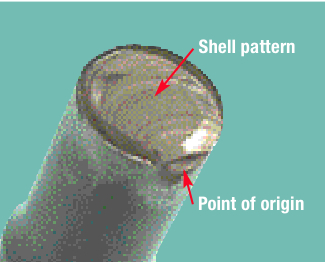 The shell pattern on the point of the punch to the left indicates the failure origin and direction. The initial failure began in the lower right. This punch chipped across the face at withdrawal, likely due to tight clearance or misalignment. Continued production resulted in chipping and wear on the flank. Slug pulling has many causes, including sticky lubricants, punch over-entry and loose punch-to-matrix clearance. When a hole is perforated, the slug bows a from the center of the punch, creating a vacuum pocket that can cause the slug to stick to the end of the punch, resulting in slug pulling. Lubricants create a seal around the vacuum pocket, further increasing the chance of slug pulling. Punch over-entry generates a similar problem— the further a punch is over-entered, the greater the vacuum it creates at withdrawal. Regular punches with no means of slug control must maintain a relatively tight punch-to-matrix clearance. The resulting tight fit of the part material around the point of the punch can cause galling and heat damage to that area of the punch. Rings around the point indicate that the part material has sprung back on the point at snapthrough, grabbing the end of the punch. The tight fit on the point generates heat, discoloring the area just behind the tip and potentially damaging its heattreat and reducing tool life. 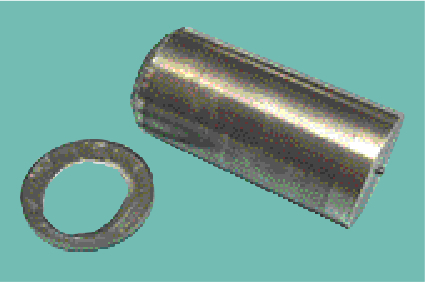 Punch withdrawal from the part material can generate as much as two-thirds of the punch wear. Because regular clearance can produce a hole that is as much as 0.002 in. smaller than the point of the punch, it creates a press-fit condition on the point of the punch with every hit. With regular clearance, the hole in the part contracts and grabs the end of the punch. The slug expands and becomes jammed in the matrix. Abrasive wear on the punch and matrix will be excessive. The radial arches in the shell pattern indicate the point of origin and direction of the failure. The initial failure began in the upper left portion of the punch face. This punch chipped across the face at withdrawal and was due to tight clearance, misalignment and a fixed stripper. The opposite reaction occurs when applying engineered clearance, minimizing potential slug-jamming problems. An engineered clearance produces a hole larger than the point of the punch, leaving a slip-fit condition and eliminating as much as two-thirds of the wear incurred when using regular clearance. However, increasing punch-to-matrix clearance reduces slug size. This leaves the slug loose and free to pull up at withdrawal. A hole in the side of the punch vents the vacuum pocket, allowing the ejector pin to push the slug a without resistance. Slug jamming, most commonly occurring when perforating thin and or soft material, can lead to punch breakage or matrix splitting. Along with a tight punch-to-matrix clearance, excessive land length in the matrix can cause slug jams. Reducing the land length in the matrix will lead to fewer slugs held in the land, requiring less force to drive them out. Land length should not exceed four times material thickness. Increasing the clearance will reduce the size of the slugs and allow them to fall freely through the matrix; it also will reduce wear on the punch and matrix, improving tool life. Uneven galling is an indication of misalignment. 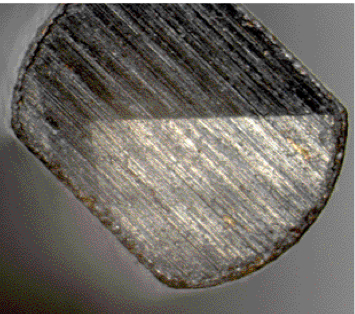 In severe cases, misalignment can lead to chipping or even breakage, shown here. The S curve in the break illustrated here is common for this type of failure. 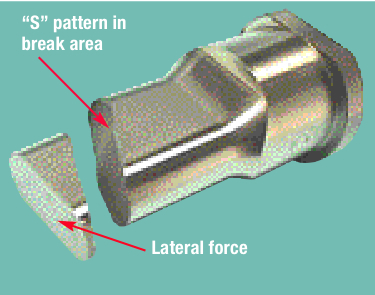 Misalignment can result from lateral forces generated by forming operations; worn guide pins and bushings in the die; or loose gibs in the press ram. High-load applications such as forming of stainless steels, spring steels and high-strength low-alloy steels call for tool steels with a combination of shock resistance and high compressive strength. M2 or PM-M4 alloys tend to work best in these applications. The particle-metallurgy process makes possible the manufacturing of very-high-alloy tool steels with improved toughness and machinability. It also provides better distribution of carbides, which in turn minimizes directional failures related to traditional tool-steel manufacturing. Compressive strength is a little known and often overlooked characteristic of tool steels. It is a measurement of the maximum load an item can withstand before deforming or resulting in a catastrophic failure. A common failure location due to excessive compressive loading is in the radius-blend area. However, not all radius-blend failures result from compressive load. Grinding burn and lateral deflection of the punch point also may result in failures with similar symptoms. Punch deformation is another form of compressive failure. Deformation can occur at the point or behind the guide in the stripper. In most cases, properly tempered tool steels will bend or deform before breaking. Punch-point bending often is considered a sign of insufficient hardness. 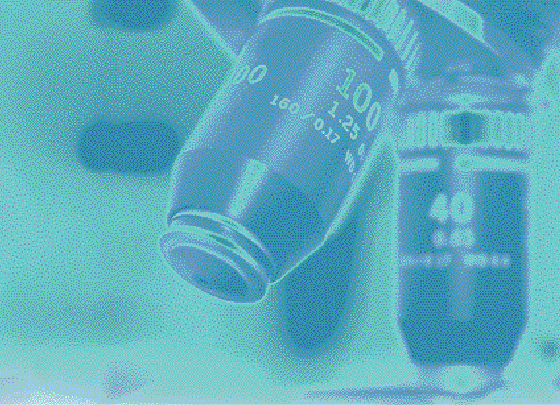 Proper hardness-testing methods require special procedures when checking round or bent items. Accuracy of hardness testing is greatly enhanced by grinding opposing flats. Reducing the diameter or chamfering the mounting-surface portion of the head minimizes or eliminates compressive loading and flex of the unsupported outer diameter at impact. It also is important to chamfer the bottom of the counterbore in the retainer to avoid interference with the fillet radius under the head of the punch. The three most effective methods to prevent head breakage: Increase the punch body diameter; apply a shear configuration to the punch point; and hold the backing-plate hardness between Rc 45 and 48. As a general rule, spring strippers should be used whenever possible and punches should not be allowed to pump in the retainer. The broken point shown here resulted from misalignment and stripper interference. The uneven wear pattern on the punch cutting edge indicates misalignment of the punch and matrix, creating lateral stress. This stress combined with interference with the stripper reduced punch life. Note the ring around the punch in the radius-blend area—a result of hitting the stripper. To avoid this interference, the stripper should be cleared and punches should not be over-entered. Initial punch loading can be reduced by utilizing shear angles on the face. Shear angles come in many configurations. A single flat shear reduces the load, but tends to deflect the punch laterally and cause uneven and excessive wear, punch and matrix chipping, and punch-point breakage. The single flat shear typically is used on shaped punch points. A double-flat shear has two flats on the face and often is referred to as a roof-top shear. This design works best on oblong and rectangle punch-point shapes. Concave roof-top shear leads to punch-point chipping and splitting and should be avoided. A bevel shear will reduce punch load and minimize punch-point chipping; however, this design tends to induce wear. 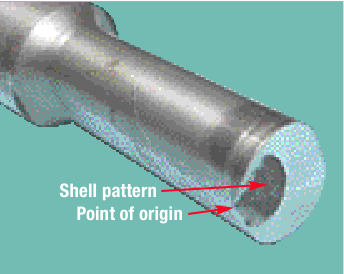 Conical shear is the best configuration when perforating with a round punch. The load reduction is greater than the bevel shear, wear is evenly distributed around the point, and the slug is deformed enough to minimize slug pulling. Although shear angles can reduce initial impact and total load, the angles themselves can induce other types of failures. Flank chipping often results from a lateral concentration of load generated by the shear angles on the punch face. This vertically ground punch has a rough grind finish on its face. A closer look revealed grinding burrs on the punch face that should have been removed prior to coating. The burrs will fracture upon contact with the material, and the coating will be compromised after the first hit. Sharp corners on shaped holes present unique problems. The concentration of stress and load in a sharply contoured area such as corners on a rectangular, triangular or spline punch results in excessive burrs and premature punch failure. This problem is aggravated by manufacturing limitations and hardened-tool-steel characteristics. Grinding a punch with sharp outside corners can be accomplished with relative ease; however, current manufacturing capabilities still make it difficult to wire-EDM or grind inside corners on die sections and matrixes to a sharp corner. Because EDM wire is round, the corners in the die section or matrix will have a radius of approximately 0.006 in. Grinding these corners will produce similar results due to corner breakdown of the grinding wheel. The radius actually provides a benefit: If a sharp corner existed, it would create a stress riser that could lead to premature failure. If you leave sharp corners on a punch, they likely will become chipped and worn through regular use. This generates a high amount of burnish and an excessive burr in the associated areas of the hole. To eliminate the burr and minimize punch wear, apply a generous radius of at least 0.020 in. to the profile corners of the punch. In fact, to achieve optimum tool life, a small radius should be applied to all sharp external corners when possible. Care should be taken when sharpening punches and matrixes.Heavy passes with a grinding wheel, use of the wrong grinding wheel, an undressed grinding wheel or lack of coolant are just some of the things that can lead to grinding damage. Types of grinding damage include discoloration, surface cracks and flaking. Internal stress and changes in hardness also affect tool life. The punch face can flake off due to rapid surface heating—the surface expands at a much faster rate than the rest of the punch, causing it to separate. Improper sharpening can lead to a catastrophic failure, as the punch can split due to load and surface cracks caused by grinding heat. Cracks occur when heat builds up in the punch. Unlike flaking, cracks result from a much deeper heating. There is no single solution-but heaps of options - like I said at the beginning, there's no hard and quick manual that states to the idea solutions into all of your issues. Today in the event you introduce a certain problem to some panel of experts, then you're guaranteed to get many different comments and solutions in yield. This will turn out to be confusing. Kambiz, Do not fret, I found this reference very helpful too. I googled and found it at daytonlamina.com. or Google "dayton_tech-steels.pdf" bottom of p.11 is figs 44/45 "Grinding Burn". There's your reference!